Seven diamonds lie in the center of this beautiful diamond flower petal cross necklace in 14K white gold from Apples of Gold Jewelry! The seven diamonds in the center of this highly polished cross total 0.10 carats, and are arranged in a sweet flower petal design. 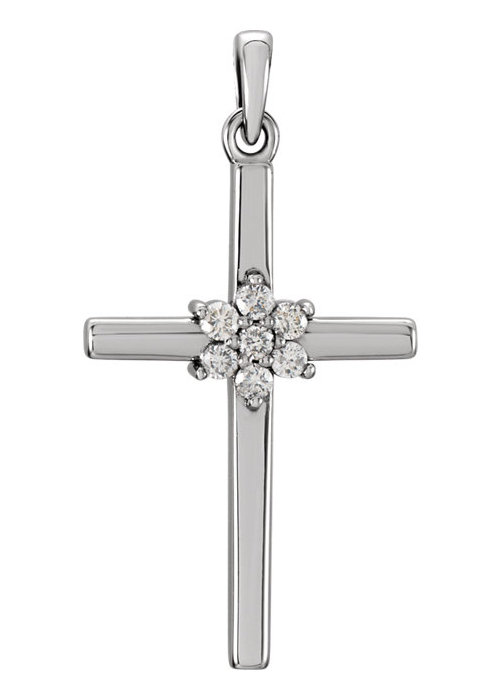 The diamonds are rated G-H for color and I1 for clarity, and ensures that plenty of dazzle is added to this smooth and polished white gold cross pendant. The whole pendant measures 1 inch tall and just over 1/2 inch wide in size. "But they that wait upon the LORD shall renew their strength; they shall mount up with wings as eagles; they shall run, and not be weary; and they shall walk, and not faint. "(Isaiah 40:31). We guarantee our Diamond Flower Petal Cross Necklace, 14K White Gold to be high quality, authentic jewelry, as described above.